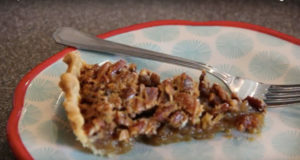 Watch how to make Belle’s Bourbon Pecan Pie in the video above! Pecan pie is a must at my house during the holidays, but I also bake these sweet pies often throughout the year. The combination of gooey, sweet filling and crunchy pecans is a favorite with my family, plus it is such a simple pie to make. And when I want to kick it up a notch, I add a little holiday cheer in the form of bourbon. You don’t need much to add a wonderful warm and rich flavor to the sweet filling. Bourbon is simply whiskey that is distilled from corn rather than barley or rye. And if you don’t want to use it, you don’t have to. This pie is delicious even without the extra shot of holiday spirit. In a bowl, beat the eggs. Add the melted butter, corn syrups, sugars, vanilla, and bourbon and beat well. Stir in the pecans until they are well coated. Pour the mixture into an unbaked 9-inch pie shell and bake at 350 degrees for about an hour or until the filling is set and the top is nicely browned.